It sure is tough being the sheriff of a mining town out in the middle of nowhere. Click here to play! None of the bad men really care about your Silver Star, and they'll shoot you down just as soon as tip their hat. Fights in the local saloon get worse everyday, which means there'll be a gang war that'll descend on the town and tear it to shreds. Good thing you hid yourself a howitzer in the clock tower then, ain't it? Some of the deadliest shootists from all around will likely fight it out in the town square in the next few days. Expensive bounties on all of their heads, and they’ll be easy to mow down from a high point. With just a little luck, you won't have to carry that Silver Star for much longer, and this town will be free of bandit scum for quite some time. 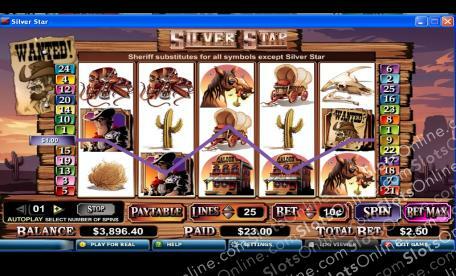 In the Silver Star slots, you are a sheriff who has to protect his town from all threats. With a run down horse and wagon, a holster that catches your gun on the draw more times than not, and a saloon nearby filled with criminals, the situation doesn't look good. Thankfully, you're the luckiest sheriff who ever lived, and you're renowned for collecting the bounties of the most dangerous men of you day. The Silver Star Sheriff's Badge symbol is the scatter in this game. It pays out on the total bet when 2 or more land on the reels, and triggers the bonus feature when 3 or more are on the reels. The Sheriff symbol is wild, and it substitutes for any symbol other than the scatter. The bonus game is triggered when 3 scatters land on the reels, and it takes the player to a shooting gallery. The player then presses the shoot button to fire at the metal ducks. A random prize is awarded for each duck shot, and the player gets 5 shots.